World Snnoker Championship Day 3: Crucible Debutant Jamie Jones stunned Former World Champion Shaun Murphy by 10-8 to advance to second round. Murphy led the Welshman by 5-4 overnight and the first two frames of final session were shared, including an effort of 101 from Murphy. Jones levelled off 7-7 before putting himself in front of Murphy with 136 to go 8-7 up. Jones won the next long frame before Murphy pulled one back. Breaks of 32 and 26 in frame 18 built Jones the biggest victory in his career so far. "I've never felt pressure like that in my life," said Jones. "I started off yesterday and struggled to settle down and got into it by the end of the session. Today was a bit of a mixed bag, I was playing some great shots and missing some easy ones. I've never played an occasion like that in my life.'' He added, "I know how well I've been playing, I knew if I scored well then I could win. I was just happy to be here, I just went out there to enjoy it and enjoy the experience. To come out a winner is fantastic." The 2005 World Champion who was going up in the first round said, "It was a fantastic game, I really enjoyed it. Its sounds funny saying that having got beat. I thought the match was really high quality, I thought Jamie held himself together really well and he didn't play like a debutant. He played a lot better than me on my debut, so full credit to him.'' Congrats to Jamie! The game between Matthew Stevens versus Marco Fu was expected to be close and intense pre-match but eventually Fu could not give his best, having trailed 1-8 at the end of first session, unstoppable Stevens defeated the Hong Kong cueman by 10-4. 17-year-old Belgian Luca Brecel's run at the Crucible is ended by Stephen Maguire. The young lad was 3-6 behind the Scot before today's session kicked off. He won two frames today including a break of 86 but Maguire proved that he was too strong for Brecel - runs of 101 and 94 secured his victory. 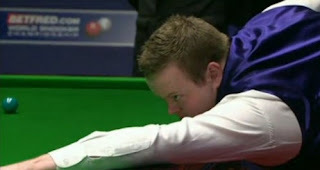 Brecel said in post-match press conference, said: "I didn't play my best, unfortunately. Until next year! I think if I had won the second frame today it might have been a different match. The Rocket Ronnie O'Sullivan led China Open Winner Peter Ebdon by 7-2 after finishing the first session of their match. PTC Grand Finals Winner is 4-5 behind Andrew Higginson and they resume playing at 7pm tomorrow. World Snooker released statement regarding Mark Allen's post match comments. 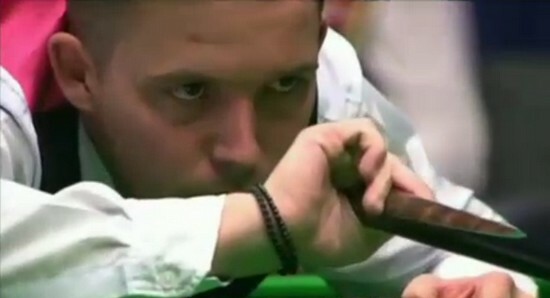 The WPBSA will be writing to Mark Allen to initiate disciplinary proceedings. Allen was recently fined 1000 pounds for comments he made during Haikou World Open which he won, and now faces further action.